Binchotan charcoal sticks filter and absorb heavy metals, chlorine and impurities for a 2 litre capacity of water. It is the purest charcoal on earth and effectively removes unpleasant taste. Can also be used to purify the air, and absorb unwanted smells and excess humidity in cupboards. 240g. The Japanese Holm Oak is harvested carefully for the Binchotan; artisans only cut off selected branches, leaving the trees alive and healthy. Once the charcoal can no longer filter water, it can be crushed and returned to to soil, to fertilise and hydrate your garden. Biodegradable and 100% responsible packaging, 100% recyclable. 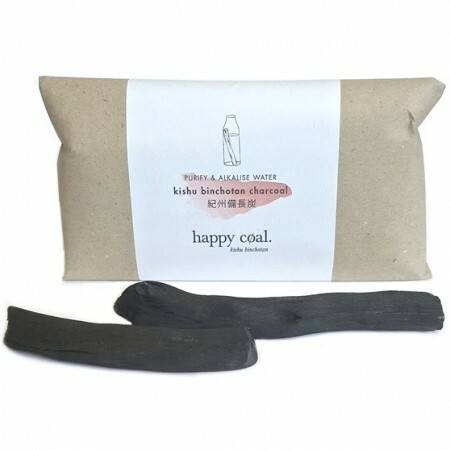 Kishu Binchotan produces the highest quality charcoal in the world, handmade in the Wakayama prefecture in Japan and is made from Japanese Holm Oak. Binchotan charcoal has the highest carbon percentage, up to 98%. The unique, ultra-porous structure is a powerful filter, and eliminates chlorine, heavy metals and impurities that cause unpleasant taste in water. 240g = assorted small Binchotan pieces, enough to filter 4L of water. Reuse for up to 2 months. Boil charcoal every 3 weeks to refresh and remove build-up. Suggested use: put your Happy Coal filter in your water jug at home, to top up effectively throughout the day. Can also be used to purify the air, and absorb unwanted smells and excess humidity in cupboards. Remove from packaging and place charcoal into boiling water and boil for 5 minutes to sterilise. Remove and cool. Put charcoal into a water bottle. Use 60 g per 1 l of water. Fill with tap water. Warning - the charcoal is easily breakable - take care not to drop it. Leave for at least 5 hours to filter. For best results, leave overnight. Enjoy clean, soft, delicious, alkalising water. Once the filter is no longer effective, compost it in your garden. I purchased these as a gift for my mum, as she complains about the fluoride taste in regular tap water. She places a filter (60g) in a jug full of water overnight to make sure it has steeped for 5 hours. She's said that the water tastes better because she can't taste the fluoride anymore. So I'd definitely recommend these as gifts to people who need to transition from plastic water bottles to reusable ones if water taste is a major factor.